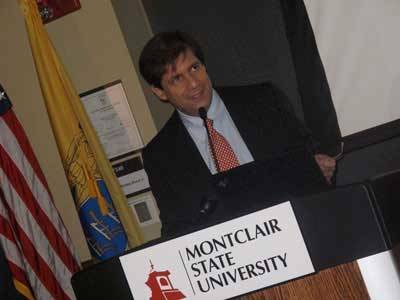 On December 2nd the Consul General Francesco Maria Talò gave the lecture "From Pizza to PhD, from Dante to DNA: updating the image of Italy" before a large audience of students at Montclair University (NJ). 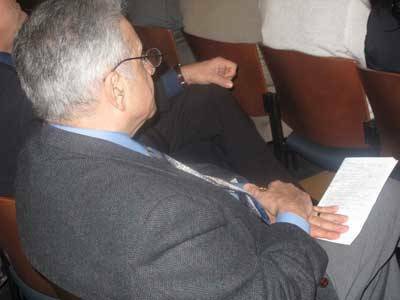 He catalogued the main Italian accomplishments of both the past and the present in alphabetical order, and talked about them with the support of a slide show presentation. Enjoy some moments of the event with our audio-slideshow! Many people refer to Italy as the country of pizza and mandolin, the land that gave birth to geniuses such as Michelangelo and Leonardo. 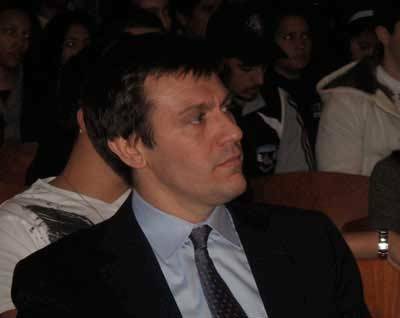 On December 2 the Consul General Francesco Maria Talò explained to an audience of students at Montclair University (NJ) that our country is this and much, much more. In his lecture "From Pizza to PhD, from Dante to DNA: updating the image of Italy" he introduced the greatest Italian accomplishments in alphabetical order. 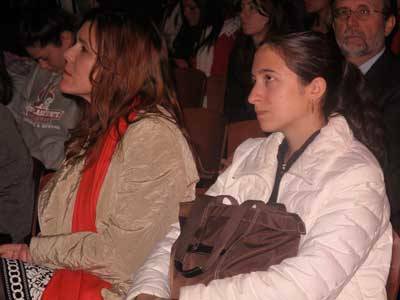 His lecture was the second of a series instituted by the University with the collaboration of the Coccia Institute. The first dates back to last year, and was given by the former Ambassador of Italy at the UN, now Ambassador of Italy in Washington, Giulio Terzi di Sant'Agata. 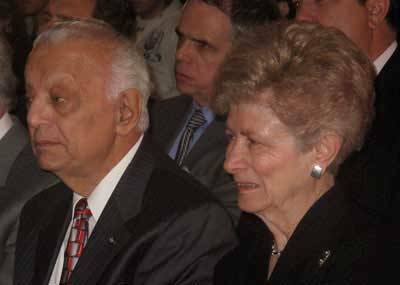 Among the public attending Consul Talò's conference were the Consul of Italy in New Jersey, Andrea Barbaria, the Founder and President of the Coccia Foundation Joseph Coccia, Jr., and his wife Elda, and its director Mary Ann Re. 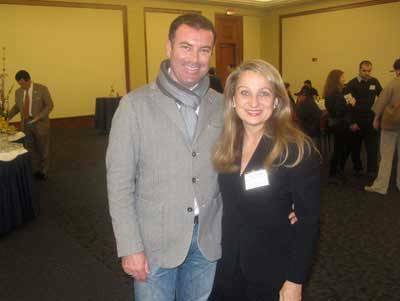 Among the other eminent representatives of the Italian and Italian-American community, the major of the island of Salina (Sicily) Massimo LoSchiavo. We feel that the best way to report his presentation is to list below the fields in which Italy can boast its accomplishments in alphabetical order, just as he did. A - Art Italy is the country of the Renaissance, of which the greatest representative is Michelangelo Buonarroti, but also of famous contemporary artists, such as Giorgio Morandi. UNESCO has recently declared that Italy holds about 2/3 of the artistic heritage of the world. C - Creativity The world has benefited from Italian creativity in every phase of history. The Italian Alessandro Volta, as an example, invented the electric battery, giving birth to a new field of science. The world "voltage" was indeed coined after him. Leonardo da Vinci is another example: he was not only an artist, but also a science man and an engineer. And, finally, Guglielmo Marconi, who invented the radio. Today we have other examples of creative Italian men. One of them is Roberto Benigni, who won the Oscar prize for his movie "Life is Beautiful". D - Design Design is a key factor to having success in today's economy. You need to "sell" your products. Lella and Massimo Vignelli, two Italian architects living in New York, designed the map of the city's subway system. E - Emigration. Italian emigrants contributed to the modernization and progress of this country. Most of them have found a better life here and have prestigious jobs. Two of them are Nancy Pelosi, the Speaker of the Chamber of Deputies, and Janet Napolitano, the Secretary of Homeland Security. They are both proud Italian-Americans. Today Italy itself has become the "new America" for many, mostly Italian and African emigrants. F - Fashion. There are Italian boutiques spread all over New York City, and in the other big metropolis areas in the US. We could almost say that NY's Madison Avenue has recently become our new "Little Italy", a symbol of Italian distinction in the field. G - Galileo and Guidoni. 2009 is the International Year of Astronomy, and celebrates the 400th Anniversary from Galileo's discoveries. Today Italian astronauts such as Umberto Guidoni honor Galileo's discoveries working with their American and foreign colleagues on new research. H - History. Italy is the product of History: it has seen empires and conquerors on its territories, but has been reunified only recently. There has been an Italian culture for more than 2,000 years, this being the culture of Rome. I - Industry. Italy is an industrial country in a post-industrial era., but it is its industrial capability that has been a key factor in facing the recent financial crisis. FIAT is just one of the many companies that have expanded their market recently. Its most famous model, the Cinquecento, is now available to American drivers, thanks to its recent acquisition of Chrysler. L - Literature. Aside from famous writers of the past such as Dante and Petrarch, we can count a significant number of writers of Italian nationality and ancestry nowadays. Among them are the Italian-American John Fante, Umberto Eco and Alessandro Baricco. M - Mediterranean Diet. Mediterranean products are part of the Italians' daily life. Nutritionists and scientists also agree that our diet is the key to maintaining good health. It is important to introduce authentic Italian products in our meals. O - Opera. Verdi, Rossini, Puccini: names of which everybody in the world heard about. They are the composers and writers of operas such as La Traviata, La Tosca, Il Barbiere di Siviglia. One of their major interpreters was, needless to say, the Italian singer Luciano Pavarotti. P - Peacekeeping. 80.000 Italian troops are deployed in the main international war areas to protect peace and the local populations. Many of these soldiers are located in Afghanistan and Iraq, and work very closely with Nato, American, and other Allied countries' soldiers. Q - Quality of life. The Italian way of living is something for which we are envied. We know how to enjoy nature, art, and good food. R - Rome. Rome is commonly defined as the "caput mundi", the center of the world, for its historic, political, and religious importance. The attention of the media often focuses within its walls, just as happened when Pope John Paul II passed away: nearly every channel broadcasted the same scene. From the architectural point of view, moreover, it is the city of the Colosseum, also of MAXXI - Museum of Architecture of the XXI century - inaugurated just a month ago. S - Sport. The most famous sport in Italy is soccer, but it is not the only one played. Our athletes have also won gold medals in swimming, fencing, and skiing, as well as many other sports. T - Tools and Technology. Antonio Meucci, an Italian living in New York, was the one who invented the telephone, and gave start to a revolution in humanity's way of communicating. Italians are also the main utilizers of cellphones: we have 147 mobile phones for every 100 people, including the new-born babies! U - University. Italy is the country where the concept was born, being that the University of Bologna was the first to be founded in the entire world. However, we recognize that it is America that can offer the best graduate education nowadays: that's why many of our smartest and best students decide to pursue their education here in the US. Nowadays most of them are members of the ISSNAF (Italian Scientists and Scholars North American Foundation), and constitute one of largest group of European scholars in this country. V - Vespa. It is a symbol of Italian life-style. Its design has been constantly improved and modernized, and is a great means of transport in big cities where the traffic is heavy. Since the cost of gas has risen so much Vespa is becoming an American favorite as well. Z - Zoom. "There are not many words in the Italian vocabulary that start with the letter 'Z', so I decided to use 'Zoom' to wrap up my lecture and take the occasion to thank all of you, students and researches, that listened to me with such an evident interest".